Sofia. On January 2, when the Church commemorated one of the most beloved hermits - Saint Seraphim of Sarov, a piece of Saint’s relics was taken from the Russian Church of St Nicholas the Miracle-Maker in the capital city Sofia to the Patriarchal Cathedral, where at the decision of the Holy Synod of the Bulgarian Orthodox Church the relics will remain for the future and will be lying in state, the press office of the Holy Synod of the Bulgarian Orthodox Church announced. The relics are a gift from the Russian Orthodox Church, provided at the request of Patriarch Neophyte of Bulgaria to Patriarch Kirill of Moscow during his peaceful visit to Moscow in 2014. A solemn service was held at the Russian Church on Saturday morning. During the service the relics were lying in state. With a following special procession the relics were taken to the St Alexander Nevsky Cathedral. The procession was headed by a brass band and the National Guards Unit of Bulgaria. Patriarch Neophyte of Bulgaria welcomed the relics at the Cathedral and symbolically received them from the representative of the Russian Orthodox Church to Bulgaria – Archimandrite Philip (Vasiltsev). Patriarch Neophyte then held a prayer service before the relics. Icons of Saint Seraphim of Sarov were given as presents to the Christians attending the service. Saint Seraphim of Sarov (born Prokhor Moshnin) was born in the city of Kursk, Russia, in 1754. He was raised in a respected family of traders. His father was building temples, while his mother was taking care of her three children, as Prokhor was the youngest. He wanted to become a monk since his early childhood. Saint Seraphim’s contemporaries say that the saintly healer was helping people not as much as with his kind words as with the love and joy he shared. He was addressing everyone with the words “My joy!”. 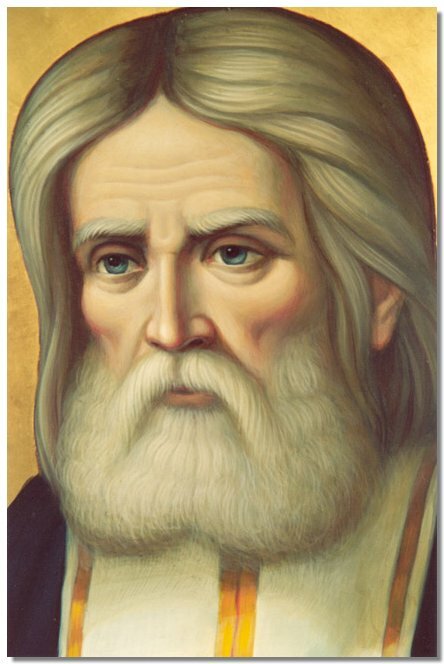 Saint Seraphim died on January 15, 1833.